Origin: Oceano Pacifico e Oceano Indiano orientale. Una popolazione non indigena in California. Majestic nocturnal predator. Despite being rather static requires a large tank with plenty of hiding places, live rock and good filtration. Since the fins are equipped with sharp beams and the ridge is poisonous (as in all Scorpenidae) and may attack if it feels threatened, it is advisable to interpose a sheet of plexiglass between the animal and the owner of the tank during maintenance. The poison is not fatal, but the resulting wound is very painful and can sometimes go in necrosis and may take several days to heal. We therefore recommend extreme caution when handling it, do not use nets but transparent plastic bags to catch it. In the event of a puncture soak the affected area in very hot water and call your doctor, especially if difficulties arise in respiration or wound became necrotic. Carnivorous, feed with live and frozen foods such as small fish, shrimps, mussels and Mysis. 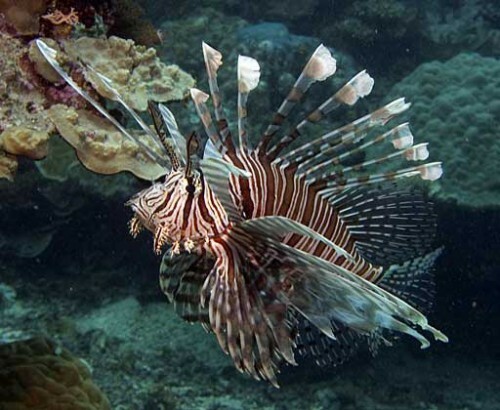 Given its nature, relatively peaceful but predatory, can not be kept with smaller fish or shrimp. Sometimes it may accidentally prick their tank mates while moving if kept in relatively small tanks, often with serious consequences. It's also a rather solitary animal, and often performs in parades towards other fish of the same species. Therefore, breeding with other fish tanks is recommended only in much larger and it is advisable to keep a single specimen. Very delicate phase of acclimatization, often many specimens only accept live food initially and may be subject to disease if acclimatization is not gradual (best choice: the method of "drip"); once acclimatizing itself, is a long-lived fish and robust. Reproduction has never happened in aquarium.